Posted on December 4, 2018 - By Fucosoft | Follow YouTube, Twitter to Get More Information. Are you facing the iPhone or iPad keyboard not working issue when you’re trying to type a text message or note? Though the iPhone keyboard has improved greatly in recent years, lots of users have been involved in the very same situations, such as keyboard lag, frozen, not popping up after updating to iOS 12 or screen replacement. Don’t worry. This article will help you out of the trouble. Here we will discuss several common iPhone keyboard not working problems and how to fix them with ease. If you’re typing a message but your keyboard fails to keep up and becomes super laggy, it means that your iPhone has the problem of keyboard lag. It is a common issue for iPhone users. You can reset keyboard dictionary to fix this problem. Tap on General > Reset > Reset Keyboard Dictionary. When prompted, enter your password to confirm. Frozen keyboard is one of the most common troubles faced by iPhone users. It is a situation that the keyboard of your iPhone suddenly freezes or becomes unresponsive while you are using it. 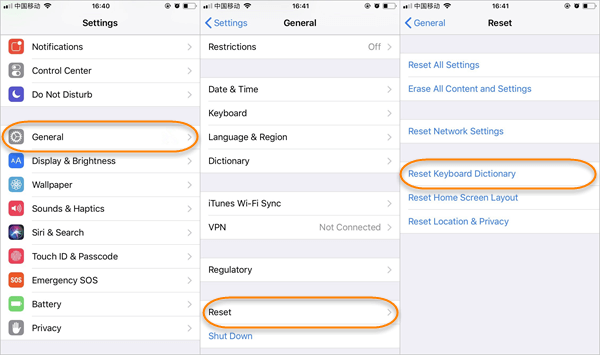 You can either restart or hard reset your device to fix the iPhone frozen keyboard issue. If you iPhone can still be shut down normally, just press and hold the Power button until the “slide to power off” notification appears. Move the slider to right to turn off your iPhone, and then turn on it. If your iPhone can’t be shut down in normal procedure, you have to do a hard reset. iPhone XS (Max)/XR/X/8: press the Volume Up and then Volume Down buttons in quick succession. Then press and hold the Side button until the Apple logo appears. iPhone 7/7 Plus: press the Volume Down and Side buttons, keep holding both buttons for at least 10 seconds until the Apple logo shows. In some cases, your iPhone keyboard won’t even pop up when you need to type something. If you are experiencing the iPhone keyboard not showing issue, you can try to fix it by rebooting your iPhone. If the reboot doesn’t work, you might need to restore your iPhone using either iCloud or iTunes. Before doing this, you should back up all your iPhone data since the restore process will wipe out all data on the device. On your iPhone, go to Settings > General > Reset and select “Erase All Contents and Settings”. Enter your passcode to confirm, and then follow the on-screen instructions to restore your iPhone. Connect your iPhone to the computer you have stored your backup and launch iTunes. Click on “Restore Backup” and select a relevant backup, then tap “Restore” and wait for the process to be complete. 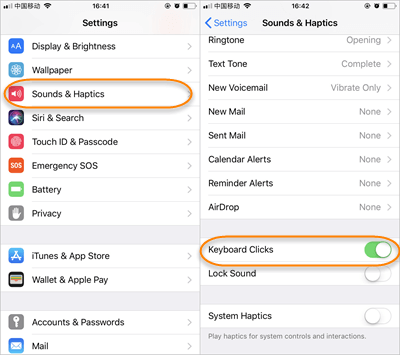 On your iPhone, go to Settings > Sounds & Haptics. Scroll down to locate Keyboard Clicks and make sure it’s turn on. If the above solution still doesn’t work, you can try to turn your iPhone off and then turn it back on. This should help to fix the iPhone keyboard typing noises not working problem. On your iPhone, go to Settings > iCloud > Documents & Data. Turn off Documents & Data if it is on and try to use the keyboard shortcuts. If they are working, you can turn back on Documents & Data. If your iPhone keyboard not working properly, you can try the above methods to fix it. However, some of them might cause data loss. Instead of restoring iPhone from iCloud or iTunes, here we’d like to recommend a third-party tool to help you solve the problem without data loss – Fucosoft iOS System Recovery. This program can not help you fix the iPhone keyboard not working problem, but also help you fix other issues like iMessage doesn’t say delivered, or iPhone contacts missing names etc. It supports all iOS versions, including iPhone XS, iPhone XS Max, iPhone XR, iPhone X, iPhone 8/7/6s/6 Plus and iOS 12. Launch the program and choose “Standard Mode”. Then connect your iPhone to the computer via USB cable and click “Next” to continue. Wait for the program to detect the device. If not, follow the one-screen instructions to put your iPhone into DFU mode or Recovery mode. Select the exact info of your device and click “Download” to download the suitable firmware matching with your device version. After the firmware is downloaded, click “Start”and the program will start to fix your iPhone keyboard to normal state. We’ve rounded up 6 ways to fix the iPhone keyboard nor working issue for you. Choose the one that best suits your situation. To avoid data loss, we suggest you try Fucosoft iOS System Recovery. It will help you do more than just fixing iPhone keyboard not working properly problem, but also help you restore your device back to normal start if your iPhone stuck in recovery mode, DFU mode, Apple logo, boot loop, black screen, white screen, and so on. iPhone is Disabled Connect to iTunes? How to Unlock ?